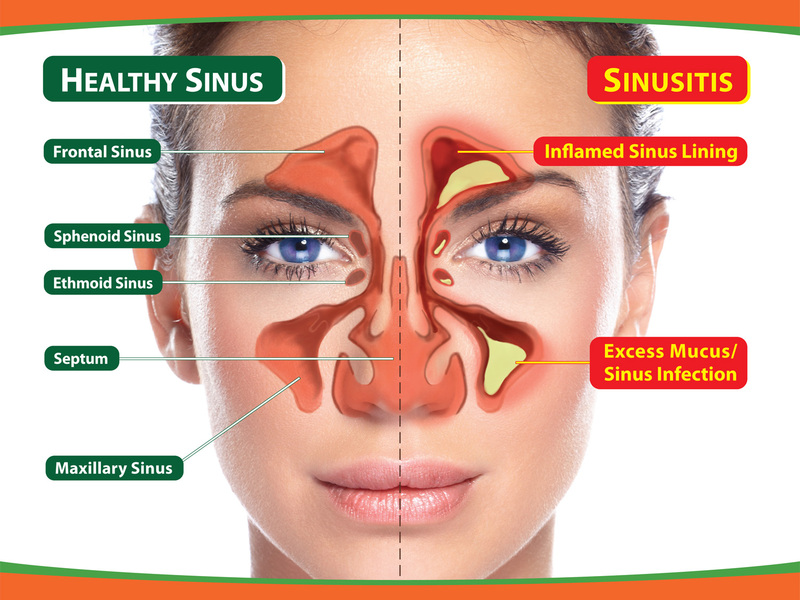 Sinus infection, where nasal swelling causes allergic reactions which may put even more pressure on adjacent sinuses. Too much stagnant mucous within the sinus, promoting bacterial growth. A vacuum state within the cavity may develop caused by swelling which in turn leads to a stuffy nose and really bad pain. 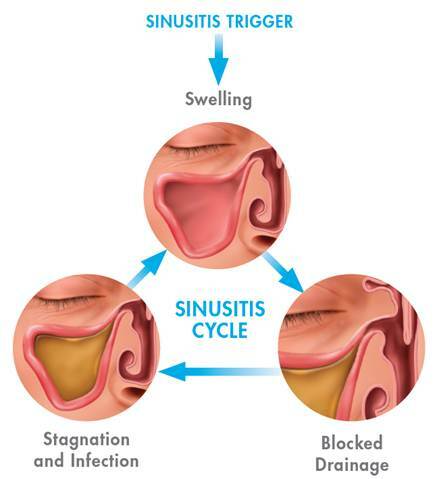 Those who suffer from sinusitis have more than one sinus blocked and infected, where most symptoms cannot be relied upon to point out exactly where the infections and inflamed areas are. As the areas of infection may be spread out, sufferers may experience differing symptoms, where a bad headache first thing in the morning is the first sign that sinuses may be inflamed. Cheeks, teeth and jawbones may experience sensitivity and pain when touched especially if the maxillary sinuses are affected. Most medical treatments include steroid type nose-drops and antibiotics. In many cases several types of antibiotics are prescribed to clear a sinus infection. In chronic sinusitis this medical treatment can go for extended time. But let’s face the truth here, most of us do not enjoy such medications if not necessary as these chemical substances do wreak havoc on our bodies, not to mention they cost an arm and a leg! One of the more natural ways to solve sinusitis issues that has been gaining more and more recognition is that of salt therapy. This therapy brings relatively quick relief when it comes to diminish the pressure in sinuses and clearing the mucus blocked there; the pain and inflammation reduce as well and salt therapy prevents the occurrence of these symptoms from flaring up as frequently. Salt therapy is known to kill bacteria and allows for the airways to be cleared of mucous and inflammation. It’s a safe and effective form of treatment for sinusitis and even younger kids can benefit from utilising a device such as the SaltAir – home salt therapy device. Strengthen your immune system against respiratory tract illnesses. Clear away mucous from the sinus cavities. Get better blood oxygenation and allow for better overall health. The SaltAir device has been clinically proven to help and heal symptoms associated with sinus infections. It is so easy to use, non-invasive and the principle of the device is based on the proven health effects and benefits of salt in respiratory ailments. Cystic fibrosis, also known as mucoviscidosis is a genetic disorder where the autosomal recessive gene is affected. 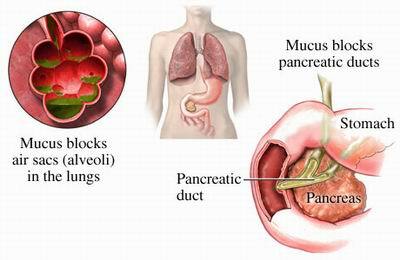 The disease affects the lungs, heart, pancreas, liver and intestines. It is characterized by abnormal transport of sodium and chloride through epithelium, making the secretions thick and viscous. The first indication of cystic fibrosis are salty skin, poor growth, thick sticky mucus, frequent respiratory infections, persistent cough and shortness of breath. Frequent lungs and sinus infections result from clogging because of the thick sticky mucus, reduce ciliary mobility and inflammation. The lungs of persons with cystic fibrosis are infected and colonised with bacteria from an early age. These types of bacteria and their characteristics change and develop in time in persons with cystic fibrosis, because they have a perfect environment in the thick viscous mucus and they develop resistance to commonly used antibiotics. COPD, on the other hand, includes under its umbrella other chronic respiratory diseases, such as emphysema and chronic bronchitis. COPD stands for "chronic obstructive pulmonary disease" and symptoms include many debilitating symptoms: shortness of breath, cough of thick mucus and poor lung function. In chronic bronchitis the lining of the breathing tubes become inflamed and lots of mucus is being produced and coughed up. With emphysema, the walls of the air sacs in the lungs are broken down and more air is trapped inside. Many people have both, chronic bronchitis and emphysema. The respiratory complications can be reduced using salt therapy. Hypertonic saline solution is used in hospitals to help in clearing the thick stagnant mucus and avoid infection. The long-term salt aerosol exposure in home salt therapy, provides exposure during the night sleep, when the micro particles of salt slowly deposit on the respiratory mucosa. It helps to make the thick mucus more fluid, unclogs the airways, fight bacteria, viruses and reduces the inflammation. Using Saltair, home salt therapy device, will create a seashore microenvironment in your own house helping you to breathe better naturally. Sinusitis is a painful infection and/or inflammation which occurs behind the forehead and even behind the cheek bones where your sinuses are located. Bacteria or viruses may cause such infections due to the accumulation of mucus within the sinus cavities. Such infections may be caused by allergens found naturally within the home, office or outside environment, where various symptoms may be presented such as a pounding headache, nasal secretions varying in colour from yellow to green and trouble breathing. Even though sinus medications may ease such symptoms, it’s important to remember that such methods are but temporary ways of relief with many having other side effects themselves. Salt room therapy is an all-natural process in order to treat sinusitis as well as a sinus infection by opening up any blockages found within the sinus tract itself. Salt therapy works with the particles reaching inside of the tract and then pulling out any fluids found which increase the rate of clearing out any mucus. Such actions reduce oedema of the nasal mucosa which are the main causes of blockages leading to acute sinusitis and even chronic sinusitis in extreme cases. The clearing of the nasal mucosa allows the air passage itself to become wider allowing for better breathing while the nasal tubes found within the sinuses can better drain fluids. Salt room therapy not only cleans out the passages and the nasal tubes, it also prevents a bacterial infection from setting in as the therapy kills off harmful bacteria. Due to the less frequency of sinus infections, dependence of antibiotics will be decreased which will improve overall immunity for the body. By re-creating the specific microclimate found within naturally occurring salt caves and mines within a specified environment the Saltair, home therapy device, releases small salt particles within the home for ease of breathing. The amount of micro salt particles is in parallel to the amount of times and the length that it is used within an area for. No salt deposits will be found within the home and it can be utilised best during the night when sleeping for around a 7-8 hour stretch. The pros of the device are many, most notably the fact that it creates the microenvironment of salt caves within the comfort of your home. Salt therapy is a drug-less method of easing any discomfort experienced with acute and chronic sinusitis while being non-invasive at the same time. The device is small and compact and can even be taken with when travelling. All members of the family (including babies and pets) can benefit from salt air therapy, as it’s not harmful in any way or form. The scientific name of cinnamon is ''Cinnamomum verum'' and comes from the Greek "Kinnamomon". Cinnamon is used as a spice and for its medicinal properties since ancient times. It is documented in China 2700 BC, in India in the Ayurvedic medicine and later in Greece and during the Roman imperium. 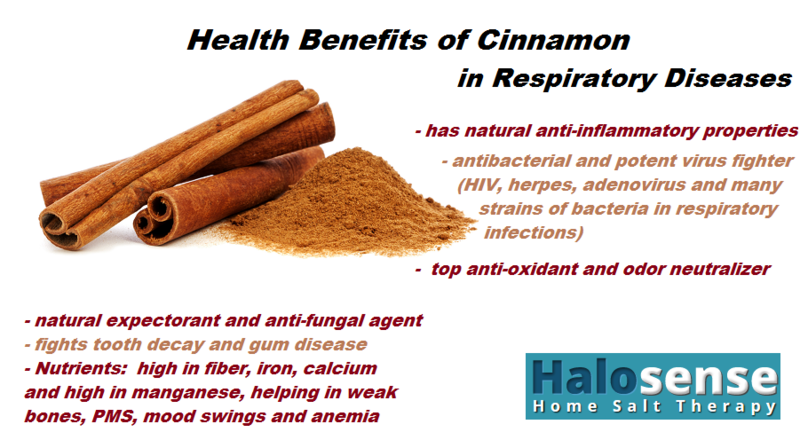 Cinnamon has many health benefits but here we will emphasize the benefits in respiratory diseases. Due to its antibacterial, anti-inflammatory and expectorant properties, cinnamon is a good ally in fighting respiratory infections such as sinus infection, bacterial infection, bronchitis, coughing, bacterial infections in cystic fibrosis, ear infection and recurrent respiratory infections. Being a powerful anti-bacterial, cinnamon is the best remedy in stomach flu and bacterial infections, fighting against Escherichia coli, Salmonella, Campylobacter, Pseudomonas aeruginosa and other strains of bacteria. Preparations made with cinnamon oil can be used as a natural disinfectant or antimicrobial agent against Escherichia coli, Salmonella, Staphylococcus aureus, Aspergillus oryzae, Penicillium digitatum to prevent respiratory or local infections. Cinnamon oil can prevent tooth decay and gum disease and can be found as a component in toothpaste, mouthwashes, chewing gum, etc. Cinnamon is also a potent virus fighter, and research studies indicate benefits in fighting HIV, herpes virus and adenovirus that causes respiratory infections. Fungal respiratory infections can also benefit from its anti-fungal property. Cinnamon is one of the top anti-oxidants in the world, with a value of over 250 000 μmol TE/100g. It helps to reduce the formation of free radicals that causes many diseases and helps in repairing organ damages, promoting good health. Its antibacterial and healing infections in gastrointestinal (GI) tract is not to be left aside. However since Cinnamon removes both bad and good bacteria from the GI tract you should be careful to repopulate with good bacteria by drinking probiotic or eating fermented food after taking Cinnamon for a long period of time.